A mother and child attempt to escape the flood water in Niger State, Nigeria, following torrential rains which have hit the region since mid-July 2018. The United Nations Secretary-General António Guterres said on Thursday he is “deeply saddened”, as the Government of Nigeria announced that some 200 people have died, and a further 1,310 injured, due to flooding across a dozen states. Overall, around two million have been affected. 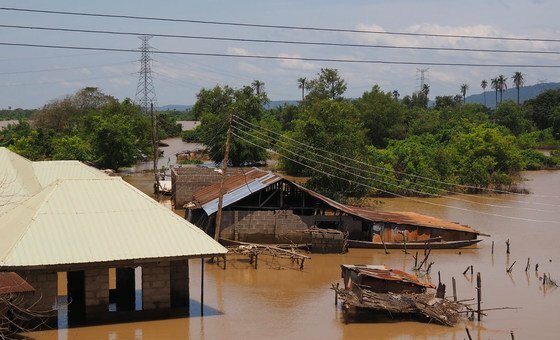 Nigeria’s two main rivers, the Niger and the Benue, burst their banks after heavy rains began in August, and the country has been experiencing large-scale floods ever since. A state of national disaster has been declared in the four most-affected states of Kogi, Niger, Anambra and Delta. More than 561,000 people are internally displaced as a result and over 350,000 need immediate help - especially temporary shelter, food, safe drinking water, household items and medical care. Flooded houses in Niger State, following torrential rains which have hit the region since mid-July 2018. Credit: UNDAC/Pierre Trouche. 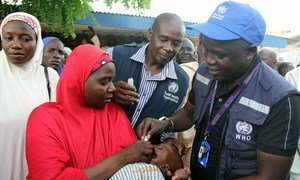 According to the UN Office for the Coordination of Humanitarian Affairs (OCHA), activities conducted so far by the United Nations include: needs assessments; the provision of emergency medical care as well as disease control for cholera and malaria, by the World Health Organization (WHO); and distributions of hygiene or “dignity” kits, for women and girls by the UN sexual and reproductive health agency (UNFPA). 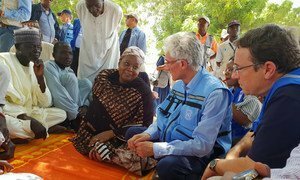 The top United Nations relief and development officials on Saturday called for national and international partners to step up support for humanitarian efforts in north-eastern Nigeria and help millions of people rebuild their lives in the region that has been ravaged by Boko Haram’s near decade-long insurgency.